​Here is an adorable picture book for curious kids, which explores skip counting and estimation in a fun pumpkin-themed classroom experiment.This book makes a wonderful read-aloud companion to any math or science curriculum, and it's a fun way to reinforce counting skills at home. "How many seeds are in a pumpkin?" 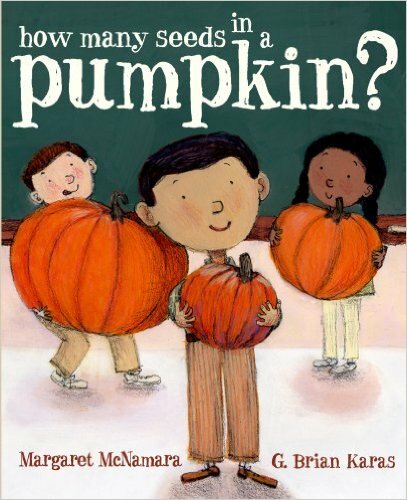 Mr. Tiffin asks his class as they gather around the big, medium, and small pumpkins on his desk. Robert, the biggest kid, guesses that the largest one has a million seeds; Elinor, sounding like she knows what she's talking about, guesses the medium one has 500 seeds; and Anna, who likes even numbers better than odd ones, guesses that the little one has 22. Charlie, the smallest boy in the class, doesn't have a guess. Counting pumpkin seeds is messy business, but once the slimy job is done, to everyone's surprise, the smallest pumpkin has the most seeds! As Charlie happily exclaims, "Small things have a lot going on inside of them."